Help Us Make A New Album!!! Hello friends. We have some big news! We’re making a new album with our long-time producer/collaborator Eric “Roscoe” Ambel. We have a fantastic batch of new songs that we’re really excited to record for you. We’re planning for a Fall 2018 release through Bloodshot Records (best record label ever!). We tried something different when recording our last album and it worked so well, we’re doing it again. Basically, instead of traveling to Eric’s studio in New York and trying to make an entire record in a single 10-day period, we’re breaking it up into several 4-day sessions at Sawhorse Studios in Saint Louis. This way we can focus more on the music instead of rushing to get it done. But doing it this way costs more versus a single recording session. So we came up with a plan to raise funds for anyone who wants to help us cover the extra costs. You’ll be the first ones to get the new album and also get some very cool limited edition stuff in exchange for your help. + Pre-order of the new album. Autographed CD or Vinyl. We’ll ship CDs and Vinyl to arrive a few days ahead of the official release date. We don’t know the exact date yet but we’re planning on sometime in the Fall of 2018. + Limited Edition “Executive Producer” T-shirt. This new shirt was designed by Chris Kro and is only available as part of this fundraiser. There will be no re-prints after the sales period is over. This is a dark brown 100% soft cotton shirt. These shirts run a little bit small. So maybe order up a size? This 9.5″ x 17″ poster designed by Chris Kro and signed by the band. Printed on heavyweight uncoated recycled paper. Only available as part of this fundraiser. There will be no re-prints after the sales period is over. High quality heavy canvas tote bag. Perfect size for carrying vinyl or any other stuff you wanna tote. Only available as part of this fundraiser. There will be no re-prints after the sales period is over. 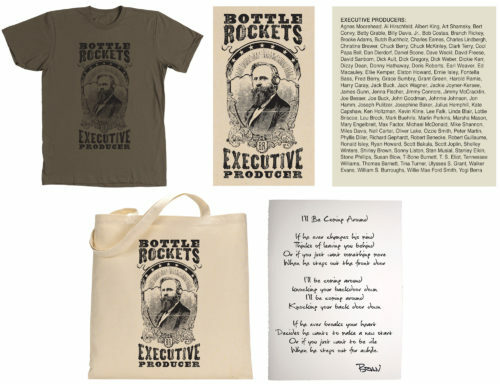 + A handwritten lyric sheet of any Bottle Rockets song of your choice. You choose your favorite Bottle Rockets song and Brian Henneman will handwrite the lyrics for you on archival paper suitable for framing. + Exclusive MP3 download of a demo from the new album. Once your order is complete you’ll get a download link. For now, there will be a placeholder there until we have the MP3 from the band sometime in March. + Your name in the liner notes of the new album. That’s right! We’ll put your name in the liner notes of our new album as an executive producer. Once your order is complete you’ll get a download link. For now, there will be a placeholder there until we have the MP3 from the band sometime in March. We’ll send you an email letting you know when the song is ready to download. The fundraiser will end on February 28. Shirts, posters, tote bags and lyric sheets will be shipped to you at the end of March. Demo recording will be delivered via download sometime in March. CDs and Vinyl will be shipped separately to arrive on or before the official album release date sometime this Fall. Exact date to be determined. Your support is greatly appreciated! We know this will be your favorite Bottle Rockets album yet.